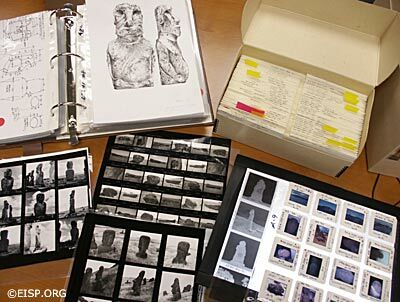 The Easter Island Statue Project (EISP) database is a comprehensive, interactive, searchable computer-based file of all moai data collected by Jo Anne Van Tilburg and her various field teams during archaeological fieldwork on Rapa Nui and, as well, during her extensive museum studies since 1982. The purpose of EISP is to amass large quantities of objective data in standardized ways, creating a body of information which, when analyzed, enables the recognition of patterns illustrating shared cultural norms that will allow for outlining and defining the prehistoric social system. The EISP database contains the following broad categories of data types: quadrant descriptions, quadrant images, site and statue images, site type definitions, statue type definitions, statue measurements, site descriptions, narrative field notes, statue condition reports, cross-reference identifiers, political divisions, historical and ethnographic observations, and survey and excavation histories. The materials that make up the EISP database are all contained in the EISP. Everything is stored in safe conditions, with duplicate backup records in three different locations. The database itself is stored on three computers, one of which is with Van Tilburg and the other with C. Arévalo P.